NUREMBERG, Germany--(BUSINESS WIRE)--EMBEDDED WORLD—Cypress Semiconductor Corp. (NASDAQ: CY), the embedded solutions leader, today announced a new line of its PSoC® 6 microcontrollers (MCUs) designed to give Internet of Things (IoT) designers confidence in the security of their applications. 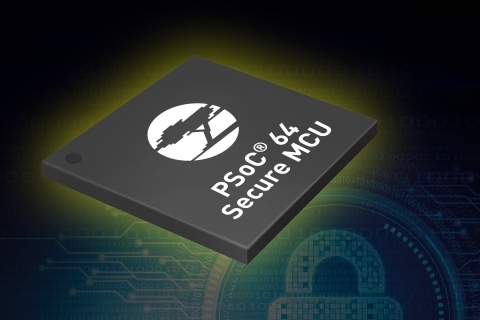 The new PSoC 64 Secure MCUs integrate robust, standards-based system layer security software with the hardware layer features available in the ultra-low-power PSoC 6 architecture. Specifically, PSoC 64 Secure MCU devices provide an isolated root-of-trust with true attestation and provisioning services. In addition, the line includes devices that deliver a pre-configured secure execution environment supporting the system software of various IoT platforms, providing TLS authentication, secure storage, and secure firmware management. The MCUs also include a rich execution environment for application development, with an embedded RTOS from Cypress’ ModusToolbox™ suite that manages communication with the secure execution environment. Cypress introduced the PSoC 64 Secure MCU line, which integrates robust, standards-based system layer security software for IoT applications.